Aertsen, I. and Peters, T. (1998) "Mediation for reparation: The victim’s perspective,"
Bazemore, G. and Schiff, M. (2001) "Restorative Community Justice. Repairing harm and transforming communities"
Cincinnati, Anderson Publishing, 375 p.
Bianchi, H. (1994) "Justice as Sanctuary: Toward a New System of Crime Control"
Bloomington, Indiana University Press, 199 p.
The Prison Service Journal, 123, 9- 12. Braithwaite, J. (2002) "Restorative justice and responsive regulation"
Oxford, Oxford University Press, 314 p.
Braswell, M., Fuller, J. and Lozoff, B. (2001) "Corrections, Peacemaking, and Restorative Justice"
Cincinnati, Anderson Publishing, 164 p.
Breton, D. and Lehman, S. (2001) "The Mystic Heart of Justice: Restoring Wholeness in a Broken World"
West Chester Pennsylvania, Chrysalis Books, 321 p.
British Journal of Criminology, 42, 3, 469-667. Brunk, C.G. (2001) "Restorative justice and the philosophical theories of criminal punishment,"
in M.L. Hadley (ed.) The spiritual roots of restorative justice. With an introduction by Michael L. Hadley, Albany, SUNY Series in Religious Studies, 31-56. Cayley, D. (1999) "The Expanding Prison. The Crisis in Crime and Punishment and the Search for Alternatives"
Toronto, House of Anansi Press, 405 p.
Christie, N. (1977) “Conflicts as Property"
The British Journal of Criminology, 17, 1, 1-14.
Corrections Today, 59, 7, 6, 8, 68-114. Coyle, A. (2001) "Restorative Justice in the Prison Setting"
Driebergen, Paper presented at the conference of the International Prison Chaplains Association (Europe), 11 p. [Online] Available: http://www.kcl. ac.uk/depsta/rel/icps/restorative_justice.doc. Coyle, A. (2003) "Humanity in prison: Questions of definition and audit"
London, King’s College, International Centre for Prison Studies, 86 p.
Cragg, W. (1992) "The Practice of Punishment: Toward a Theory of Restorative Justice"
Csaba, K. (2000) "Adult prison work camps. Achieving rehabilitation outcomes in partnership with the community"
Paper presented at the conference Reducing Criminality: Partnerships and Best Practice, Perth, 31 July - 1 August. [Online]. Available: http:// www.aic.gov.au/conferences/ criminality/csaba.pdf. Deming, R.R. (1981) "Correctional restitution. A strategy for correctional conflict management"
in B. Galaway and J. Hudson (eds.) Perspectives on Crime Victims, Toronto, The C.V. Mosby Company, 285-291. Dittenhoffer, T. (1981) "The victim-offender reconciliation program: a message to correctional reformers, MA thesis"
Centre of Criminology, University of Toronto, 119 p.
Dumortier, E. (2000) "Neglecting Due Process For Minors. A Possible Dark Side of the Restorative Justice Implementation?" Vienna, Paper Presented at the UN Crime Congress: Ancillary Meeting. Available. 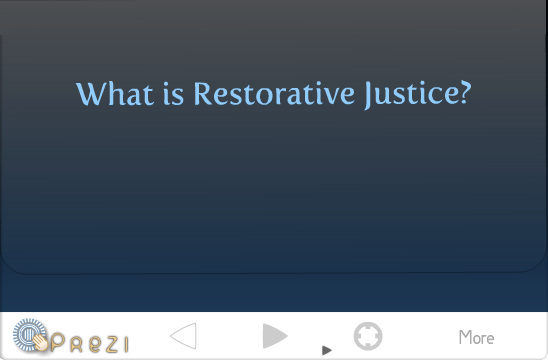 [Online] http://www.restorativejustice.org. The Prison Service Journal, 123, 6- 7. As a researcher of the Centre for Criminological Research at Oxford University, the author reports on the possibilities of restorative initiatives within the context of detention. In broad strokes, she paints a picture of the most known models of restorative programs. Journal of Correctional Education, 50, 2, 38-71. ERA FORUM, 1, 1-38, 49-51. European Journal on Criminal Policy and Research, 4, 4, 1-138. Fatic, A. (1995) "Punishment and Restorative Crime-Handling: A Social Theory of Trust"
Aldershot, Avebury Ashgate Publishing, 281 p.
Fattah, E.A. and Parmentier, S. (eds.) (2001) "Victim policies and criminal justice on the road to restorative justice: Essays in honour of Tony Peters. With an introduction by E.A. Fattah and S. Parmentier"
Leuven, Leuven University Press, 460 p.
Criminal Law Bulletin, 8, 8, 681-691. Contemporary Justice Review, 4, 1, 59-74. Francis, V. (2001) "Restorative Practices in Prison. A Review of the Literature"
London, King’s College, International Centre for Prison Studies, 11 p.
The literature on restorative justice is wide ranging but certain common principles emerge from the literature that would be accepted by most theorists and practitioners. Networks, 13, 3. Available. [Online] http:// www.ncvc.org/newsltr/restjust.htm. International Review of Victimology, 6, 4, 261-416. Contemporary Justice Review, 6, 1, 55-68. Hadley, M.L. ed. (2001) "The spiritual roots of restorative justice"
New York, State University of New York Press, 264 p.
Criminal Justice Policy Review, 10, 3, 363-399. The ICCA Journal, 3, August, 34-35. Johnstone, G. (2002) "Restorative Justice. Ideas, Values and Debates"
Devon, Willan Publishing, 190 p.
Johnstone, G. ed. (2003) "A Restorative Justice Reader: Texts, Sources, Context"
Devon, Willan Publishing, 520 p.
Karp, D.R. and Clear, T.R. (2002) "What is community justice? Case studies of restorative justice and community supervision"
Thousand Oaks, Sage, 172 p.
Monsey, Criminal Justice Press, 207-216.
in B. Galaway and J. Hudson (eds.) Restorative Justice: International Perspectives, Monsey, Criminal Justice Press, 337-347. Liebmann, M. and Braithwaite, S. (1999) "Restorative Justice in Custodial Settings: Report for the Restorative Justice Working Group in Northern Ireland"
Liebmann, M. ed. (2000) "Mediation in Context"
London, Jessica Kingsley Publishers, 256 p.
Llewellyn, J.J. and Howse, R. (1999) "Restorative Justice. A conceptual framework"
Ontario, Law Commission of Canada, 65 p.
Contemporary Justice Review, 5 (3), 261-272. The ICCA Journal, 3, August, 50-51, 55. Marshall, T.F. (1999) "Restorative Justice: An Overview"
London, UK, Home Office, Research Development and Statistics Directorate, 36 p.
Mennonite Central Committee U.S. (1994) "Reconciliation between victims and imprisoned offenders: Program models and issues"
Akron, Mennonite Central Committee U.S., Office on Crime and Justice, 24 p.
Miers, D. (2001) "An International Review of Restorative Justice. Crime Reduction Research Series Paper 10"
London, Home Office, Policing and Reducing Crime Unit, 105 p.
Mediation Quarterly (changed into "Conflict Resolution Quarterly") 12, 3, 199-297. Canadian Journal of Criminology, 42, 3, 249-420. Morris, R. (2000) "Stories of Transformative Justice"
Toronto, Canadian Scholar's Press Inc., 261 p.
Newell, T. (2000) "Responding to the crisis. Belgium establishes restorative prisons." London, Kings College, International Centre for Prison Studies, 7. Available. [Online] http://www.kcl.ac.uk/depsta/rel/icps/restorative_prison_ paper4.doc. Pranis, K. (1996) "A State Initiative toward Restorative Justice: The Minnesota Experience"
in B. Galaway and J. Hudson (eds.) Restorative Justice: International Perspectives, Monsey, Criminal Justice Press, 493-504. The ICCA Journal, 3, August, 36-39, 43. Prison Service Journal, 123, 1-23. RESTTA Program (1986) "Community Justice Alternatives: Restitution and Reconciliation"
Washington, DC, U.S. Department of Justice, Office of Juvenile Justice and Delinquency, 93 p.
Canadian Journal of Criminology, 42, 249-280. Roche, D. (2003) "Accountability in Restorative Justice. Claredon Studies in Criminology Series." Oxford, Oxford University Press, 332. Royal Canadian Mounted Police (1986) "Record of Proceedings Community Justice Alternatives Restitution and Reconciliation, May 8-9, 1986"
Ottawa, Royal Canadian Mounted Police Science and Technology Program Support Section, 122 p.
Rucker, L. (1992) "Peacemaking in Prisons"
in H. Pepinsky and R. Quinney (eds.) Criminology as Peacemaking, Bloomington, University of Indiana Press, 172-180. Salem, R.A. (1996) "Designing a Reformatory Conflict Management and Dispute Resolution System through Mediation"
in B. Galaway and J. Hudson (eds.) Restorative Justice: International Perspectives, Monsey, NY, Criminal Justice Press, 477-492. Strang, H. (2002) "Repair or Revenge. Victims and Restorative Justice"
Oxford, Oxford University Press, 298 p.
Strang, H. and Braithwaite, J. eds. (2002) "Restorative justice and family violence"
Cambridge, Cambridge University Press, 288 p.
Contemporary Justice Review, 1, 1, 1-174. Sullivan, D. and Tifft, L. (2001) "Restorative justice: healing the foundations of our everyday lives"
Monsey, Willow Tree Press, 235 p.
Texas Department of Criminal Justice (s.d.) Victim Offender Mediation/Dialogue, Texas Dept. of Criminal Justice, Victim Services. Offender Preparation Process, Austin, Texas Department of Criminal Justice, 160 p.
Manual of the Victim Offender Mediation/ Dialogue program in the state of Texas. This unique mediation program takes place in the context of imprisonment. It is initiated by the victim services. Umbreit, M.S. (1985) "Crime and Reconciliation: Creative Options for Victims and Offenders"
Nashville, Abingdon Press, 141 p.
Umbreit, M.S. (1990) "Victim-offender mediation with Violent Offenders: Implications for Modification of the VORP Model"
in E. Viano (ed.) The Victimology Handbook. Research Findings, Treatment, and Public Policy, New York, Garland Publishing Inc., 337-351. Umbreit, M.S. (2001) "The Handbook of Victim Offender Mediation. An Essential Guide to Practice and Research"
San Fransisco, Jossey-Bass, 425 p.
Federal Probation, 59, 1, 47-54.
International Review of Victimology, 6, 321-343. Van Ness, D. and Strong, K.H. (1997) "Restoring Justice"
Cincinnati, OH, Anderson Publishing Company, 228p. Von Hirsch, A., Bottoms, A., Burney, E. and Wikstrom, P.O., eds. (2003) "Restorative Justice and Criminal Justice. Competing or Reconcilable Paradigms?" Portland, Hart Publishing, 348 p.
VORP Advisory Board of the State Correctional Institute at Graterford (1992) "The Victim Offender Reconciliation Program. The State Correctional Institute at Graterford, Final Report"
Graterford, Unpubl. Report at the State Correctional Institute at Graterford, 90 p.
Walgrave, L. (1992) "Mediation and Community Service as Models of a Restorative Approach: Why Would It Be Better?" In: H. Messmer and H.-U. Otto (eds.) Restorative Justice on Trial: Pitfalls and Potentials of Victim-Offender Mediation: International Research Perspectives, Dordrecht, Kluwer Academic Publishers, 343-354. Walgrave, L. ed. (2002) "Restorative Justice and the Law"
Devon, Willan Publishing, 248 p.
Walgrave, L. ed. (2003) "Repositioning Restorative Justice. Restorative justice, Criminal Justice and Social Context"
Devon, Willan Publishing, 416 p.
The Prison Service Journal, 123, 19- 20. Weitekamp, E.G.M. (1989) "Restitution: A New Paradigm of Criminal Justice or a New Way to Widen the System of Social Control?, Dissertation, University of Pennsylvania." Dissertation Abstracts International. Ann Arbor, MI: University Microfilms, 301 p.
Monsey, NY: Criminal Justice Press, 75-102. Weitekamp, E.G.M. and Kerner, H.-J. (eds.) (2003) "Restorative Justice: Theoretical Foundations"
Devon, Willan Publishing, 372 p.
Weitekamp, E.G.M. and Kerner, H.-J. eds. (2003) "Restorative Justice in Context: International Practice and Directions"
Devon, Willan Publishing, 368 p.
Corrections Management Quarterly. Available. [Online] http://www.drc.state.oh.us/web/Articles/ article63.htm. Willemsens, J. (2001) "Restorative justice: a discussion on punishment, Thesis Master in European Criminology"
K.U.Leuven, Faculty of Law, Centre for Advanced Legal Studies, 41 p.
Wright, (1982) "Making Good. Prison, Punishments, and Beyond"
London, Hutchinson Publishing Group Limited, 316 p.
Zehr, H. (1990) "Changing Lenses. A New Focus for Crime and Justice"
Scottdale, Herald Press, 280 p.